Well, I never thought I was going to get the honour of another Secretaries Day portrait. When Pattianne retired from teaching 3 years ago, so did her tradition of having her grade primary/One or two students sneak to the office with some lame excuse, so they could study what we looked like and then go back to class and draw a FULL SIZE portrait of us. I have had several of these portraits and each year they vary so much, its amazing that I look like all of those portraits. Please check here and here for my last two..... that is before the one I got today! It all began with a cheery "Good Morning" from nicely retired Pat who bounced into the office one morning this week as she does quite often. 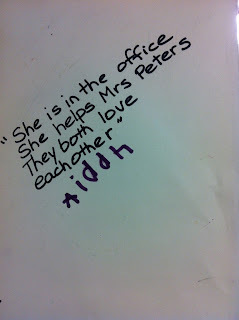 Even though she is retired, she subs in our school fairly often as well as tutoring. 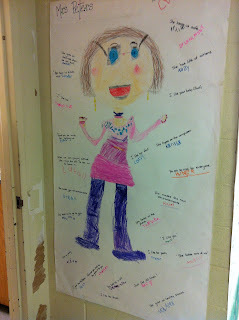 This particular day she was in a grade 1 classroom. It was always so nice to see her... but today, she seemed more than pleased with herself, and she hadn't even started her day yet. It all became very clear to me when about mid morning, 4 little people from her class arrived at the office, looking like they had a mission to accomplish. I had seen that look before... but when I asked if I could help them... they answered very quickly.... No, its ok.
Now, Melinda, my new co-secretary what taken aback by this "dismissal" by these 4 little ones, but I told her to quickly stand up and come over. We both stood there while they pretended to look all around the office, but I knew they were studying my brown sweater, my brown pants, my square glasses... hazel coloured eyes.. brown/blonde/gray hair. I talked casually to Ms Cronin, talking about her white blouse, her brown pants.. and how we both have rectangular glasses. I talked about her dark eyes... her straight dark hair and her lovely shoes. 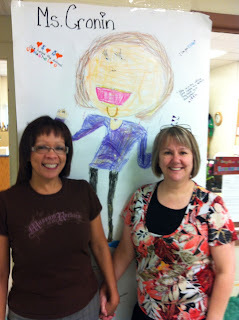 She thought I was NUTS.... but I was helping the kids to remember what we were wearing and what we looked like! This is me. with my square glasses, large blue eyes, pink and purple shirt or short dress, with a scoop neck, filled with gems and bobbles. I have two chokers on, one pink and one purple, to compliment my purple pants and big purple feet. I have many fingers, multi plus grey teeth. This is Melinda With her beautiful blue shirt/dress... her extra long, super thin black legs and killer high heel blue shoes. She has brown hair, millions of yellow teeth and no neck. She is a little uneven in the shoulder department... and I do believe one of my past pictures, I suffered the same affliction. 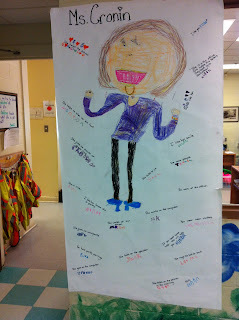 Each picture is surrounded by words spoken to Pat, the teacher, which she then writes down and they sign their name below. 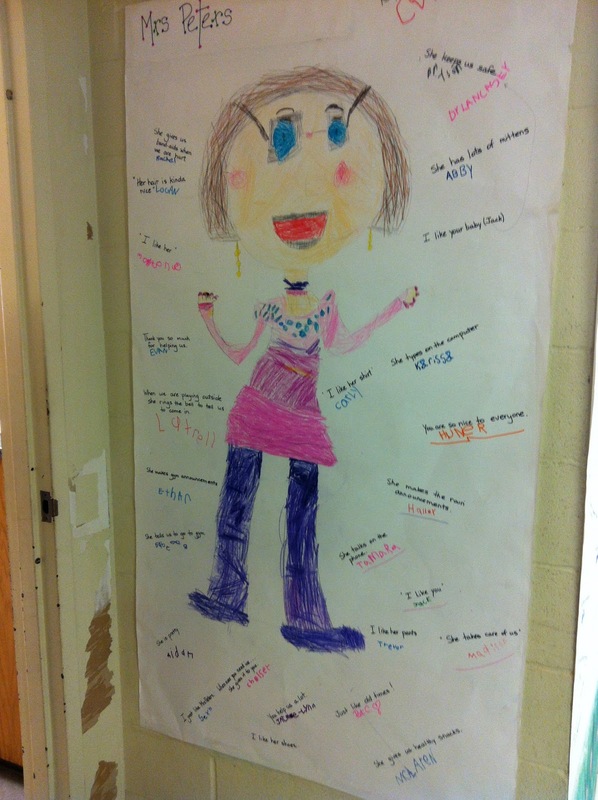 I had several standard ones like "She is pretty", "She makes the announcements" "she has lots of bananas"(referring to the snack basket near my desk). Melinda's had "She rings the bell" "She plays on her computer""She gives us snow pants". 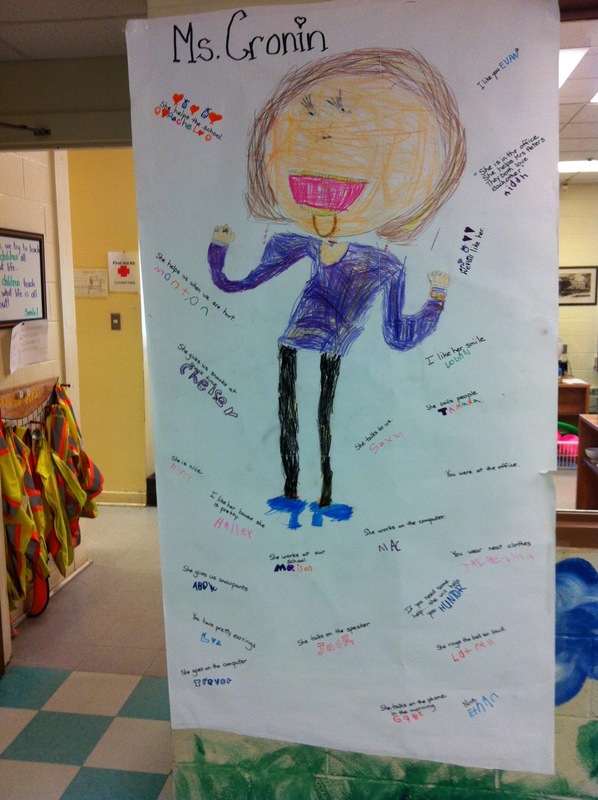 Our #1 favourite testimonial was written on Melinda's portrait though... by Aidan. 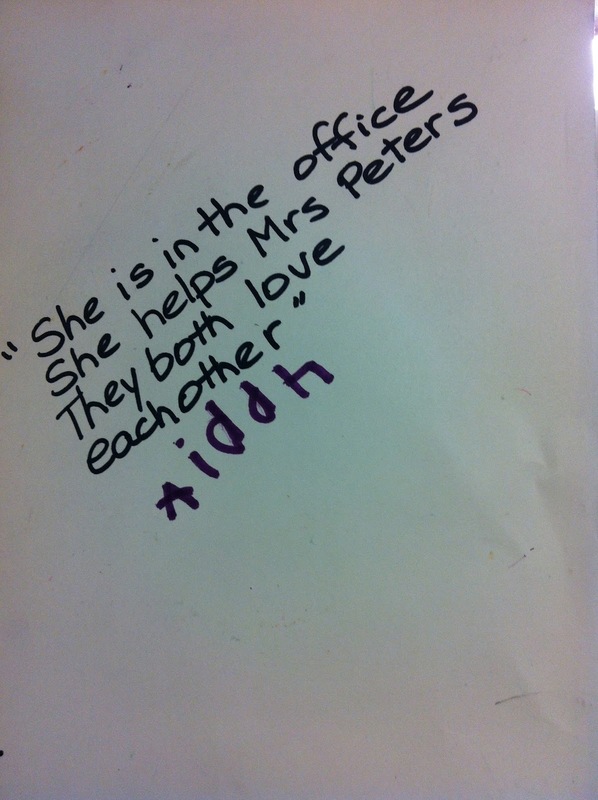 "She is in the office, she helps Mrs Peters. They both love each other"! You can't ask for anything better than to love your coworker who you work with every day! Thank you Pattianne for another great Secretaries Day! Leave it to her! A wonderful tradition to keep alive! Ahh, so fun. I love that they do this for you!! !